A reasonably-priced, powerful vacuum that's particularly good on pet hairs. 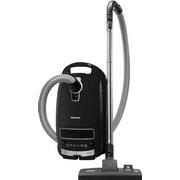 The Miele Complete C3 Powerline is a bagged cylinder vacuum cleaner with great suction across hard floors and carpets, and is a boon for allergy suffers with its active air filters. UK buyers looking for a reasonably-priced but powerful cleaner should put this on their watch list. Weighing in at a lightweight 5.4 kg, with a sizeable 4.5 litre capacity, 1200 watts of power and a 7.5 metre cord, this little gem from Germany also uses bags for hassle-free emptying. It comes with a dusting brush for delicate surfaces, a crevice tool for those hard-to-reach corners and cracks, and an upholstery tool for your sofas, curtains, and car seats. Apart from these it’s a little light in the features department. sufferers as it reduces the amount of exhaust, while the bionic filter leaves a lovely fresh aroma. The performance of the C3 Powerline is impressive. It has a C performance rating for carpets, but is actually superb at picking up dust and larger particles with the minimum of fuss, while the B rating for hard floors shows it’s not to be messed with. However, although it’s great with dust on hard surfaces, it seems to be inconsistent with large objects, requiring a few swipes sometimes to do its job. Pet hairs are dealt with admirably and the air filters do a great job of trapping the dust inside. Being relatively light it’s a great choice for vacuuming curtains and upholstery, when portability comes in handy. It’s also reasonably quiet with an output of 74 dB. Finally, with six different power settings, the C3 Powerline offers versatility and even provides a super quiet option for night time cleaning. Why you should buy it: This is a small but powerful bagged cylinder cleaner. It cleans all surfaces very well – apart from a small issue with larger objects on hard floors. Despite a low energy rating this is one to consider.